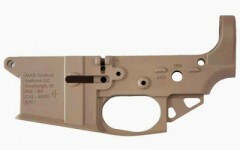 From the premium parts Mag Tactical Systems this stripped lower is made of the hardest alloy and has an excellent finish. Includes trigger guard saving you of the most annoying and unrewarding part of the lower build. FDE TAN. Includes Pins.